Charley’s Steakery franchise business opportunity. Free Charley’s Steakery business franchise information. Charley’s Steakery - What’s Hot in the Franchising Industry! The franchising industry accounts for more than $800 billion annual sales--over 20% of the entire gross national product of our country. A new franchise outlet or location opens every 10 minutes and one out of every five Americans today works either directly or indirectly in the franchise industry. “Operations such as Charley’s Steakery. . . grow, prosper and flourish in the continually thriving franchise food industry.”,- Carl Jeffers, Successful Franchising, February 1999. Food Franchises are HOT and you can be a successful part of it with a Charley’s Steakery franchise! Charley’s Steakery - Keeps Up with the Trends. . .
Research on food trends shows that today’s restaurant patrons are far more educated and health-conscious than ever before. Consumers want fresh ingredients, great taste, fair price, high quality and quick service. Grilled foods are increasing in popularity and Fresh is Best! 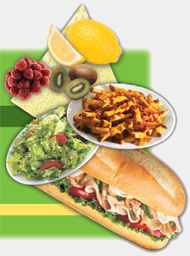 Charley’s strives to satisfy the traditional as well as the ever-changing tastes of our customers. Charley’s Steakery - has a Great Support System . . .
Our greatest strength is our restaurant operations. We start to build this strength by providing a thorough, comprehensive and intensive 3-week Training Program with both classroom instruction and on-the-job training. We assist in Site Selection, and Design and Construction—both of which are important to the success of any franchise business. We provide Purchasing Support so you will receive the benefit of high-quality products at low contracted prices. We firmly believe in assisting you with aggressive and innovative promotions with our Marketing Support. And last but not least, Charley’s has top-notch On-Going Support. We never forget that our success depends on the success of our franchisees! Providing quality food, friendly service, value and ambiance. Glorifying God by committing resources to support His ministries and local communities. Charley Shin, founder of Charley’s Steakery is fulfilling his dream to build a Fortune 500 company. He has a lifelong interest in business, a Christian faith background and a goal of being a “businessman for the Lord.” Charley says, “This is a call for me. This is not a job. I don’t know if there was anything else I wanted to do except be a businessman.” Charley didn’t know he was going to be in the restaurant business. “I never really thought about opening a chain of restaurants; it just progressed that way,” he says. Charley’s Steakery – A Team Approach . . .
Charley’s looks for individuals who are willing to devote their full time best efforts toward operating a successful Charley’s franchise. We are seeking enthusiastic, professional individuals who have an ability to relate well with both customers and employees. We look for integrity, strong organizational skills and dedication. All Charley’s Franchisees must be prepared to be team players and operate within a standard management and operations system. Our guidelines are necessary to ensure success and uniformity through the entire Charley’s franchise system. With each new restaurant open we pledge to exceed your expectations by providing products made fresh with smiles, thank-you’s and an unconditioned guarantee. Our Mission: To be America's BEST quick service restaurant. To learn more about the Charley’s Steakery franchise opportunity simply complete the form below.